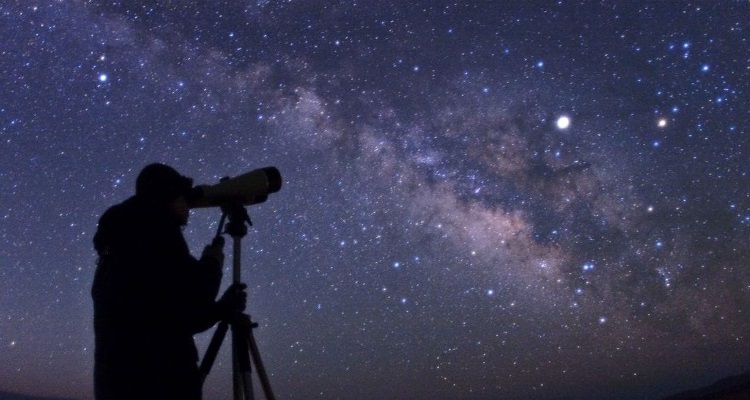 Beginners often wonder if it’s better to have a telescope or binoculars for stargazing. For beginners, binoculars are a fabulous purchase since they are so versatile. With a telescope, you’re narrowing your focus to one star or planet. As a beginner, you might not even know what you’re looking at. With binoculars, you’re getting a full sky view. It’ll feel like you’re closer to the stars and able to see more of them. Binoculars can also be used for other activities. The smaller ones can be taken on hiking trips. Larger ones can be mounted like a telescope in your backyard or balcony, too. We’ve reviewed 7 of the best binoculars for stargazing here. 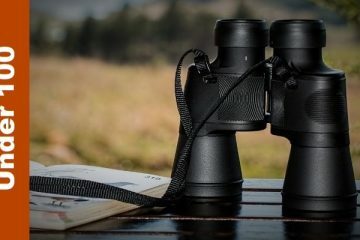 It’s broken down into comparisons that you can use to decide the best binoculars for your activities and stargazing needs. 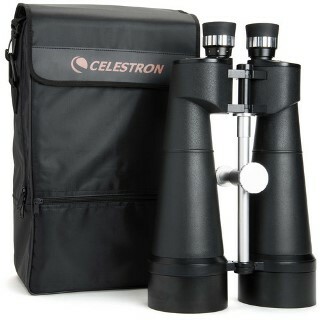 What Should You Consider Before Purchasing the Best Binocular for Astronomy? Are High-End Binoculars the Only Way to Stargaze? This is a mid-range set of binoculars in Gosky’s line of binoculars. They are designed specifically for outdoor activities like hiking or watching wildlife. You’ll definitely be able to use these for stargazing. There are roof prisms and Porro prisms. The roof prism in these binoculars allow more light to come directly to your eyes with the BAK4 prism. The 10×42 is the magnification and the lens width. It’s a binocular that will magnify by 10. That’s pretty good for gazing across the entire night sky. The lenses are 42mm. The lenses are a fully multi-coated glass with green and blue film. 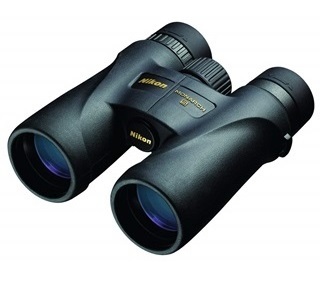 It’s vital for binoculars to have a strong frame and durable outer casing. Rubber can be shock absorbing. That will save the lens from being bumped out of whack. That will provide the most protection for your new binoculars. These have rubber armor and a durable frame. They’re also waterproof. The accessories and thoughtful extras are where these binoculars really shine. There’s a carrying case that will protect the binoculars from being broken. It comes with eye lens covers. There is a comfortable neck strap as well as a cleaning cloth for the lenses. It has a smartphone adapter, too. This is a beauty of a set of binoculars. It weighs around 23 ounces. That won’t be too hard to hold to your eyes for a long time. The ability to pair this with your smartphone is incredible. Instead of telling someone what you saw in the sky, you can show them. There’s also a place to attach a tripod. The 10×42 magnification and diameter are excellent as is the 307ft/1000yds field of view. It can be used with or without glasses. The adjustable eyecups are very convenient. There are plenty of accessories as mentioned above. You could spend a ton just on the accessories. With a strong rubber armor coating, you don’t have to worry about dropping these. The binoculars are water resistant, too. While you don’t want to toss these into a pond, they can handle a bit of water from rain. You don’t have to run inside with them when a fog hits, either. The mount for the smartphone only works for certain phones. It’s good with an iPhone 5s and above, a Galaxy S5 and above, LG, HTV, and Sony. Make sure it’s compatible with your phone before purchase. This is a set of binoculars that will give you 25x magnification. It features a Porro prism. With the Porro prism, you’re getting very precise, clear images. It lets in lots of light. Pair that with the 100 mm lens, and you’re getting binoculars that bring in lots of light. Light helps you view images better. The lenses are multi-coated, too. The wide view of 48 meters at 1000 yards will give you an experience like you’re on a space walk. These weigh almost 10 pounds. You’re not going to be able to hold these to your eyes for very long. They’ll need to be mounted on a tripod for viewing. The binoculars have a tripod adapter for that purpose, too. These are great for setting up in the backyard. It’s easy to take these along on a hike. Though, you’ll need a backpack to carry binoculars and tripod along. If you wear glasses, the eyecups will fold down for viewing. The outside of the binoculars have a rubber housing. It doesn’t feel like it would do much for protection. Yet, it really will protect your binoculars. It’s water resistant and stays cool. It won’t fog up when changing environments. The Porro prism delivers lots of light to the viewer. What this means is that you can view the sky in dim conditions. The light at dusk or dawn will translate into clear stars in your lens. That’s not usually the case when viewing during dim conditions. Along with the prism, the 100 mm lens is contributing to that amount of light you get. It gives you brighter images. Those features are giving you a better view than the magnification. The 100 mm is the widest lens that the company offers, too. These are pretty big binoculars. The body armor on the binoculars will keep them from breaking. It would be easy to drop these if you don’t use a tripod. The rugged casing should keep them safe. It’s best not to tempt fate, though. Purchase a tripod for them. The weight of these means that they can’t really be used to view things by hand. You’ll have to set up on a tripod. That means another purchase before you can use these. With the SkyMaster Giant, you’re getting a magnification of 15. It’ll look like you’re walking among the stars with this set of binoculars. They provide 70 mm width of the lens. That brings in a lot of light to the image. The lenses are multi-coated, too. A fully multi-coated set of lenses is a good deal at this price point. The field of view with these binoculars at 1000yds will give you 231 feet. If you are more comfortable with degrees for field of view, this is 4.4 degrees. It’s able to focus on close distances of 43 feet, too. These binoculars weigh approximately 3 pounds. They’re not as heavy as some other binoculars. You’ll still want to attach this to a tripod. It will save your arms. That will also take away the shakes you’ll get when you hold it. The outside casing is very durable. It has grip texture that will keep it firmly in your hand. Along with a tripod attachment included, there’s a case for the binoculars. It’ll keep them snug and secure when you’re walking to your viewing location. There are eye caps for the lenses. It’ll keep them from getting scratched. It also comes with a neck strap. 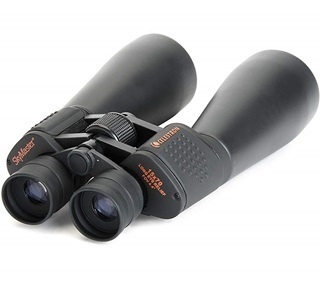 This water resistant set of binoculars are made with a durable casing. That’s important when you want to have these binoculars for years to come. You don’t have to run inside when a light drizzle starts. Fog shouldn’t be a problem, either. The casing is made of rubber armor. The rubber is textured to keep the binoculars firmly in hand. They won’t become slick and fall to the ground. You could decide to mount them on a tripod instead. There’s a tripod adapter included. These binoculars are in the middle-of-the-road on price. They’re not in the middle in terms of features. These will last for years and allow you to share them with others. No fear of breakage. It can be slow to focus. As the wheel loosens, though, it gets easier to adjust. 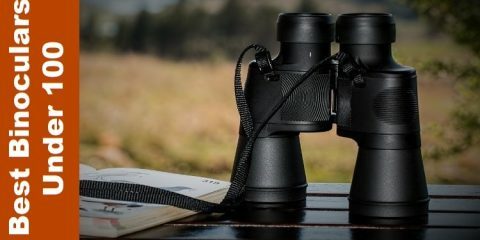 These binoculars were created specifically for outdoors people. These people want a rugged set of binoculars that are small enough to fit anywhere. These Nature binoculars weigh approximately 2 pounds. They’re slim and able to fit in the side of your pack. The binoculars have a roof prism inside. This prism has phase-correction coatings. Roof prisms split the light into pathways. The phase-correction coating will combine the light, so you don’t lose contrast. It’s a complicated way to say you get an incredible amount of light that won’t be too wavy. They are waterproof, so you don’t have to worry about the weather. Viewing the sky in any kind of weather will give you incredible views. The casing is rubber armor. You should be careful because of the lenses. But, the casing will allow for a firm grip. They’re also nitrogen-filled, so they’re anti-fog. Those with glasses like to know if there’s eye relief. The ability to move the eyecups will give you a better view. There’s 17.5 mm of eye relief with these. The twist-up cups for the eyes have multiple positions. You can pick the one that works perfectly for you. 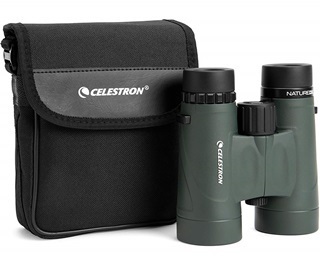 This lightweight and compact set of binoculars will fit into your bag quite easily. You can also hold them in your hand or use the strap that comes with it, too. They won’t cause arm strain. That also means you don’t have to buy a tripod to use these binoculars. They can perform many duties, too. You can use them for night viewing of the stars. They’re also good for hiking and animal or bird watching. 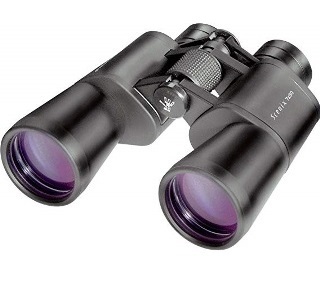 If you are an avid fan of the outdoors, you’ll enjoy these binoculars. If you wear glasses, you can still enjoy these binoculars. They’re also good for people wearing sunglasses. You can quickly put these to your eyes and see the object that fascinates. They’re great in the rain or fog. They are resistant to any kind of moisture. The focus wheel can be a bit tight. It takes some time to loosen up for easy focusing. These binoculars are made with Porro prisms. The prisms are crafted from BAK4 glass, which is a superior material. These are a high-end product in a set of binoculars that are reasonably priced. They’re within most peoples’ budgets. The lenses are multi-coated for bringing in additional light. The transmission of light through the lenses really brings more clarity to the images. The lenses are coated with an anti-reflection surface, too. All of this easily gives you better images for viewing. It could be the surface of the moon or a view of distant stars. The frame of these binoculars are not made of plastic like some competitors. This set of binoculars are made of metal. Over that metal, the binoculars have a rubber armor. It protects the binoculars from becoming slippery. They’re water resistant, which means they shouldn’t get too wet. 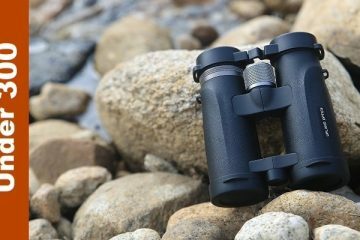 These lightweight binoculars are less than 2 pounds. They come with a carrying case and a wide neck strap. Most neck straps are not made of the best materials. This one will hold the binoculars quite easily. If you don’t want to carry it, there’s a tripod adapter. You can use that instead. The binoculars have plenty of magnification for seeing across the night’s sky. It also has a wide 50 mm lens. That will let in so much light to your image. The coatings will make sure that the image is clear and sharp, too. The best part of these binoculars is that they have advanced features. With those advanced features, you’re not getting an advanced price tag. The binocular frame is metal with a rubber over it. That metal and rubber becomes armor to protect the lens inside it. It has great accessories like the carrying case and deluxe wide neck strap. There’s also a lens cap included. 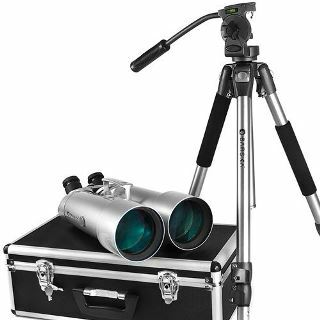 The binoculars also have the ability to pair with a tripod. This gives you hands-free viewing. You can share your view with a partner easily. The center focus button can be tight. Over time, that will loosen to provide a smoother action. These are a huge set of binoculars. They have interchangeable eyepieces. One set will magnify 20x while the other will magnify by 40. You’ll get two kinds of views with these options. You can see more of the night sky with 20 then narrow down on something of particular interest. The prism is a Porro. It’s a design that’s been around for years. The lenses are BAK-4 glass that will stay clear. They’re multi-coated for sharp images. The 100 mm lenses are semi-apochromatic. It’ll correct any kind of spherical aberrations. Colors will be true without added fringes around them. Fogproof and waterproof binoculars are ideal for night sky viewing. The change in temperatures when night hits can lead to condensation. These are filled with nitrogen, so they won’t fog. They’re also completely waterproof. The body of the binoculars are hard metal. It would take a lot to damage them. This is a huge set of binoculars weighing over 7 pounds. You’ll definitely need a tripod for them. There’s no way to hold these for very long without it weighing down your arms. The binoculars are meant for celestial viewing. They’re well worth the extra cost for a tripod. While these binoculars are meant for night viewing, they are good at all kinds of viewing. Any time you wish you had some glass for viewing. Like over the ocean or at the horizon, you’ll be glad you have these. They will move fluidly on a heavy-duty tripod. You won’t be able to throw these in your backpack on a hike without some kind of tripod. They’re just too heavy for prolonged viewing. Many people have balconies or roof decks where they want to view the night sky. This is an ideal set of binoculars for those circumstances. There was much care and thought put into the binoculars. They’re fogproof, waterproof, and made of durable materials. There will be a ton of light coming through the 100 mm lenses and past the Porro prism. It will not disappoint. The weight is a bit concerning. You will definitely need to shell out money for a substantial tripod to hold it. 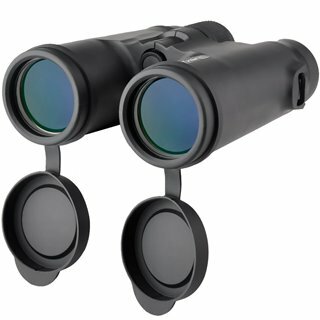 These binoculars provide 8x magnification. This will bring in much of the night sky. You’ll feel as if you’re space walking out among the stars with these. They don’t have as much magnification as some. That’s a good thing in some cases. These are great for scanning the entire sky to find things like meteor showers or shooting stars. The 42 mm lens will bring in light, and it’s aided by the glass. It has multiple layers and coatings. The lens comes from the company with it’s extra-low dispersion glass. It’s also a lead free and arsenic free glass. It’s nitrogen filled and won’t fog up. It’s also waterproof. The prism inside the binoculars is a roof prism. This allows light to go directly into the binoculars. With a Porro prism, you’re getting light that takes a bent path. The roof prism seems like a simplified way to view light, but it’s provides precision in your images. The body of the binoculars are made of a reinforced polycarbonate. It’s covered with armored rubber. This will keep it from slipping out of your hands. While it’s a durable, hardy construction, you still don’t want to drop it on the ground. This is such a light pair of binoculars. You’ll be able to stick this in the side of your bag. Take it with you when hiking, or camping. You won’t have to bring a bulky tripod with you on the trip. On the other hand, it has a place to add a tripod if you like that idea. It’s resistant to fog and water. That’s important for a clear view. You can’t see through them if you have condensation on the inside. The tubes are filled with nitrogen, which doesn’t allow for water. It will stay dry and cool inside when changing temps and environments. The best part of the binoculars are the glass lenses. They’re extra-low dispersion, which gives a clearer image. Between that, the roof prisms, and the anti-reflection coating, you’re getting crystal-clear images. The focus wheel has a slight squeak when first used. It’ll smooth out over time, though. Binoculars are better than a telescope for night viewing for a few reasons. They’re able to give you a wider view of the night sky. If you want to see shooting stars or meteor showers, binoculars work better. Telescopes focus in on one or two stars. Binoculars give you the entire night sky to view. Next, we’ll talk about the features you need to consider when making your purchase. Some are obvious features, but others are not. Hopefully, this will clear any confusion you might have. What’s the field of view? The field of view for any binoculars is an important measurement. It’s how much of the sky you’ll see through the lenses. Usually the higher the magnification, the smaller the field of view. For binoculars, you’re not going to get the magnification for viewing individual stars. It’ll come down to how much of the sky you can see. The width of your view through the binoculars is essential for viewing events. Things like meteor showers and shooting stars are easier to view in binoculars with a wide field of view. The measurement given is usually how much of the view you’ll be able to see at 1000 yards. For example, it might say you can view 300 feet at 1000 yards. Binoculars have notations that usually give the optics at 7×50. That means 7 by 50. The first number is the power of magnification. It’s how much the binoculars will magnify objects you see. The second number is the width of the lens. It’s usually the diameter. So in the example above, you’d get a magnification of 7. The second number is 50 mm across on the lens. There are so many objects to view in the night sky. It might be the many landmarks of the moon that catches your eye. Or shooting stars that you want to see. There might be a set of clusters you want to see, too. Whatever your goal, the magnification should fit. It might seem like you should get the highest magnification for your money. In fact, you should evaluate your goals first. Figure out what you want to view. After that, you can find the right power for your needs. It might not be a high magnification at all. Can they handle a beating? Whatever size and magnification you choose, it has to be portable. Part of being portable is the potential for dropping your binoculars. They should have rubber on the outside for shock absorption. This also protects them from water. There’s a chance that you could get condensation inside the binoculars. This comes from fog when the binoculars are subjected to temperature changes. It might come sealed in from the factory, too. Always look for binoculars that mention the company has removed that factor. Usually, it’ll say they’ve been nitrogen purged. Is there a tripod adapter? Having a tripod adapter is a small thing, but it makes a huge difference. Holding a heavy set of binoculars can cause your arms to shake. A tripod will allow you to see anything in the sky without it zipping around due to shake. It’s a great way to show something to a friend, too. You won’t have to find it again when removing the binoculars. It’ll be in a set position. You can move aside and let your friend see. When they’re positioned, you’re easily able to keep them in the same spot even if you move around. The weight of your binoculars will make a difference in how you use them. You’re more likely to carry them with you everywhere when they’re lightweight. If they’re heavy and bulky, you’ll likely opt to leave them behind when you go out. Hard to see the night sky if you don’t have them with you. It’s also easier to hold them to your eyes when they’re light. The weight of the binoculars can cause your arms to wobble. That causes shakes in your view. Can’t really view the stars when they’re zig-zagging in the lens. If you plan on traveling with your binoculars, think about their weight. For those who are going to be using a tripod exclusively, this will be less of a concern for you. The Porro prism was the go-to for binoculars before the 1960s. The Porro prism is designed to let light into the binoculars, but the light isn’t on a direct path. For a time, they did show better light for viewers. Then roof prisms were brought into the world of binoculars. The roof prism allows light directly into the lens without bending it at all. It’s a more complicated design, though. You are likely wondering which is better. Roof prisms have advanced to a point where they’re superior in many ways to the Porro. That doesn’t mean they’re finished, though. The Porro has some superiority in the image. They can be more precise than the roof prism. First, you’ll need to be outdoors to really get a sense of what they can view. You could look out your window to things outside, but it won’t give you a real idea of what’s possible. Take it out into the yard and view things in the sky or off in the distance. The neck strap should be connected. This keeps them from falling from your hands to the ground. The rubber casing can only protect them so much. You don’t want to ruin your brand new binoculars. If you don’t like the neck strap that’s included, you can purchase one separately. Next, it’s time to adjust the width of the binoculars. The width between your eyes will influence the width between the lenses. You’ll have to bend the binoculars to the specific distance. They should be comfortable and give you a focused view. If you wear glasses, it’s vital to pick a pair that have moving eyepieces. The eyepieces can be dialed in to make room for your eyeglasses. It’s important to wear glasses with your binoculars to help you see. There’s no reason that you can’t use binoculars with glasses. Once the width is set, adjust them to your vision. This will ensure you never have a fuzzy image in your lens. Many people have different vision in each eye. There’s a diopter setting on most binoculars. It lets you adjust one lens independently. Usually the right one. Finally, take the time to really feel them in your hand. Get comfortable holding them in your hands. Learn how to look around and then bring them smoothly to your eyes. Keep the object fixed in your sights then bring the binoculars to your face. You won’t have to scan looking for the amazing object you’ve seen. After you’ve done all these corrections, it’s time to take your binoculars outside. You can do any final adjustments outside at night. This is where you’ll really know what kind of viewing you’d like to do. Some people want to take them hiking or use them while camping to check out celestial shows. For others, they want a stable, stationary set of binoculars for in the backyard. You can get a stand specially made for binoculars. They will keep you from getting strain in your arms while holding binoculars. Expensive binoculars are not always needed for viewing the stars at night. They should fit with your viewing goals. A beginner to the world of stargazing may not understand what their budget should be. Let’s see if we can help a bit with that. Most binoculars look pretty similar. It’s when you get to the specifications that you’ll see the differences. There are some binoculars that start below a hundred dollars. Others can range upwards of a thousand dollars. The more inexpensive binoculars won’t have the right waterproofing, bag quality, or a good neck strap. You’d have to be incredibly careful with a cheaper pair of binoculars. In the mid-range, they are waterproof and have other excellent features. 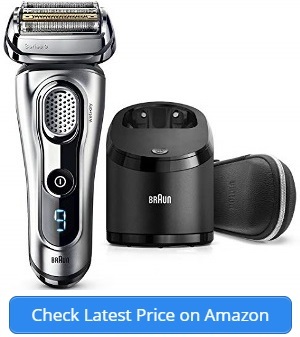 For this price, they come with pretty okay features. There aren’t many extras, though. The lenses will be coated so they’re highly reflective. They usually come with roof prisms, too. The very expensive, high-end binoculars will have great-to-excellent features. They’ll come with roof prisms, fully multi-coated lenses, water- and fog-proof lenses, and fantastic accessories. You’ll have to decide where you might not need high-end features. If you’re not worried about glare, you can leave behind the anti-reflection coatings. You might not need accessories if you’re going to be in your backyard. Most people who want to start stargazing can pick up a pair of binoculars. They have the advantage of being suitable for all kinds of outdoor activities, too. Instead of a telescope, which is only good for one. Binoculars have huge advantages since they’re portable. They can be used for bird watching and other outdoor adventures. Binoculars have features that make stargazing fun. It’ll feel like you’re walking among the stars when you use them. You’ll see much of the night sky with binoculars instead of trying to focus on one star or planet.